Congratulations Christy of Hartsville, SC! We hope he brings you great pleasure. IMA POCO MOONPIE AQHA#5282470, black gelding, foaled April 10, 2008, 15.1H. "Moon Pie" is a sweet and gentle boy who is very inquisitive and willing. He is racing bloodlines on the top, and foundation on the bottom, with Blue Valentine one off. He seems to be an excellent hunter prospect. $1800. 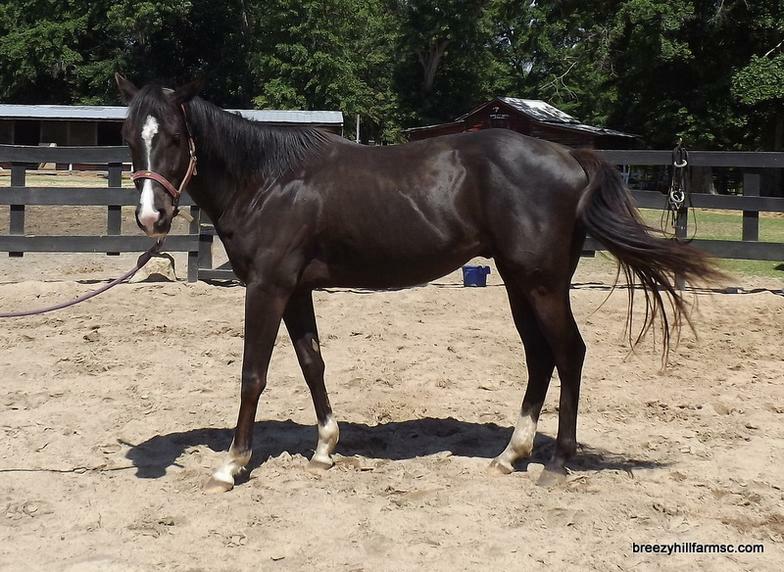 Bandit is a 5yr old, 15.3H Quarter/Tennessee Walking Horse cross. 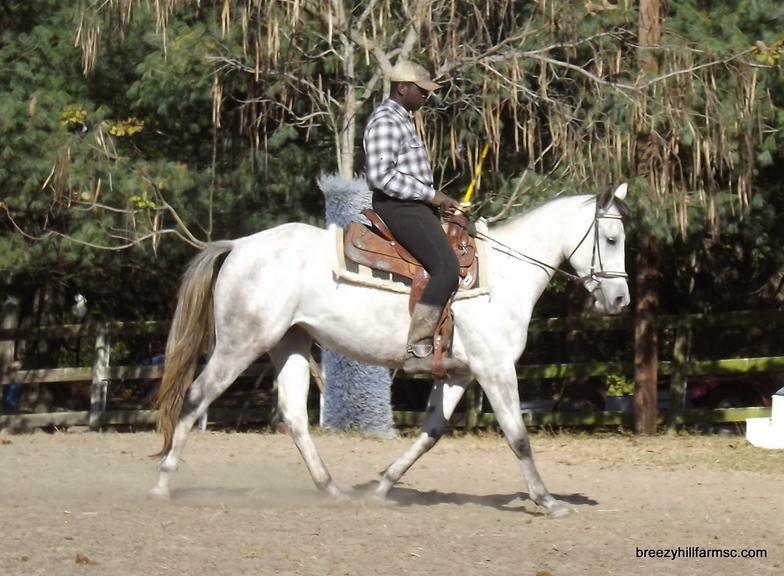 His movement was made for the dressage ring. He would also make a great trail horse as he has been ridden on the road, crossed ditches, experienced 4 wheelers, and not very much upsets him. He loves people, is very intelligent, and licks your hand like a dog. $1200. 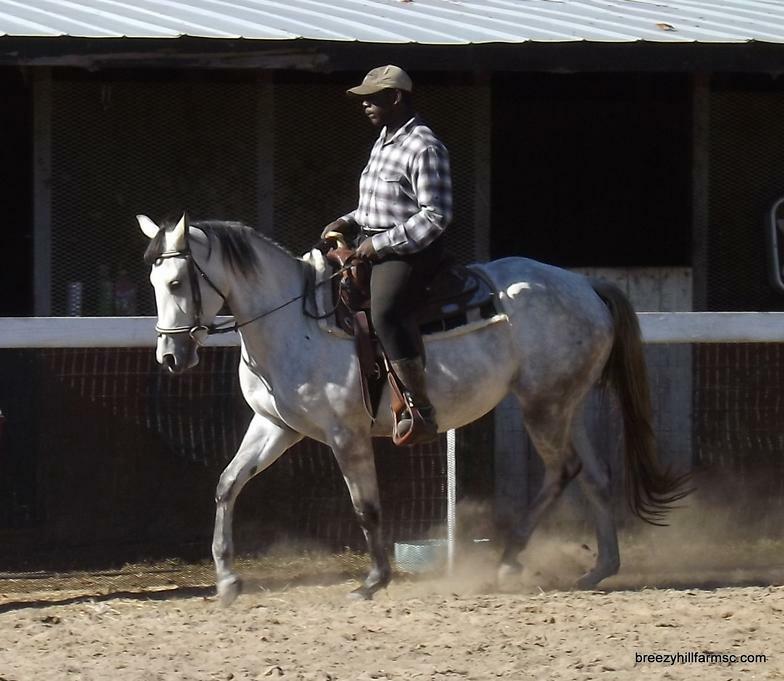 "Fearless Surprise" aka Nina, is a 5yo paint filly. 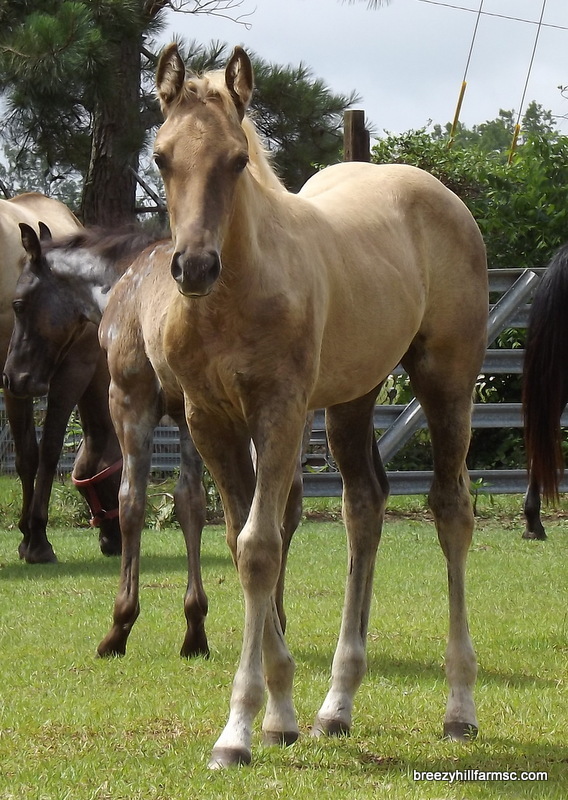 She is by Golden Gunslinger AQHA#3483753 and out of Shesa Wrangler Max APHA#188172. She goes back to Mr Gun Smoke and King, but unfortunately was not registered. She is 14.2 hands. We thought she would make a great cow horse (and probably would) but she loves to jump! 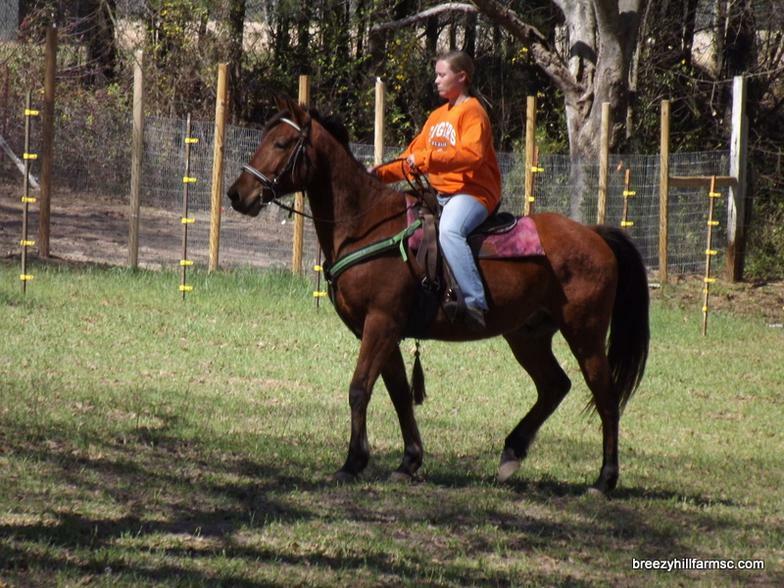 She has been to SCDCTA schooling shows, on trail rides, and is being used as a lesson horse. $2250. Ginger Snap is by Comanche and out of Bootin N Scootin apha#250367 foaled July 31, 2008. 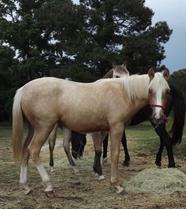 She is a palomino paint and stands 13.2 hands. She is very gentle and sweet. Her training includes w/t/c, she moves off of leg, and gives to the bit, and folds up over a jump like an eventer. She has been used in a few lessons and is eager to please and protect her rider. $1250. We are undergoing a herd reduction sale at this time. Prices may be negotiable so please inquire if you see a horse that you are interested in. New horses and pictures will be added soon. Some of these horses may also be available for lease - call for details. Blue Eyed Bar B Doll apha#526229 aka "Dolly", foaled May 1, 1999. 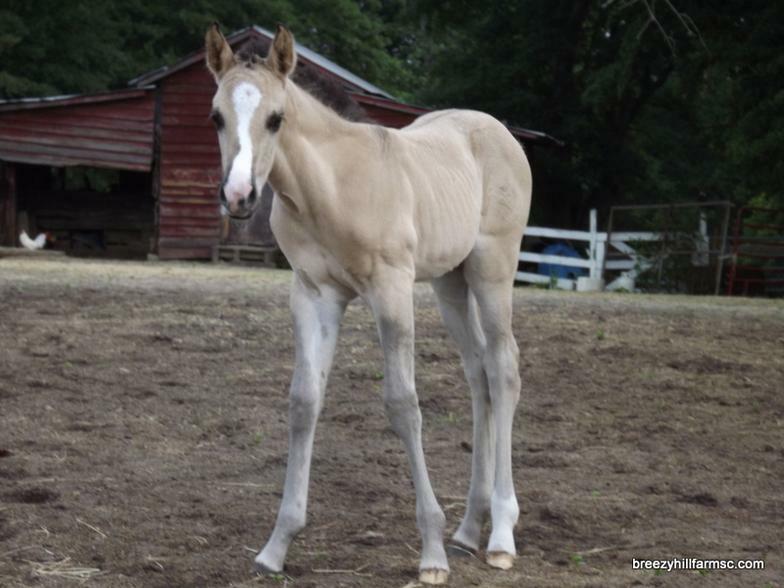 Cremello/Tobiano broodmare with two blue eyes, standing 14.3h, weighing 1095. She is an easy keeper (no grain at this weight - hay only). 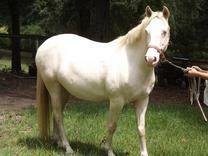 She is open, but can be covered by our stallion Peppy Dry Sun for a nominal fee with a live foal guarantee. $900. If covered, $1200. KITTYKATZ MEOW CLIO AQHA# 5276285 aka "Clio", foaled 06/24/09. Grey mare color panel tests E/e, A/A, grey zygosity pending. She stands 15.3 h and is still growing. This mare does everything quietly and willingly. She is quiet and eager to please. 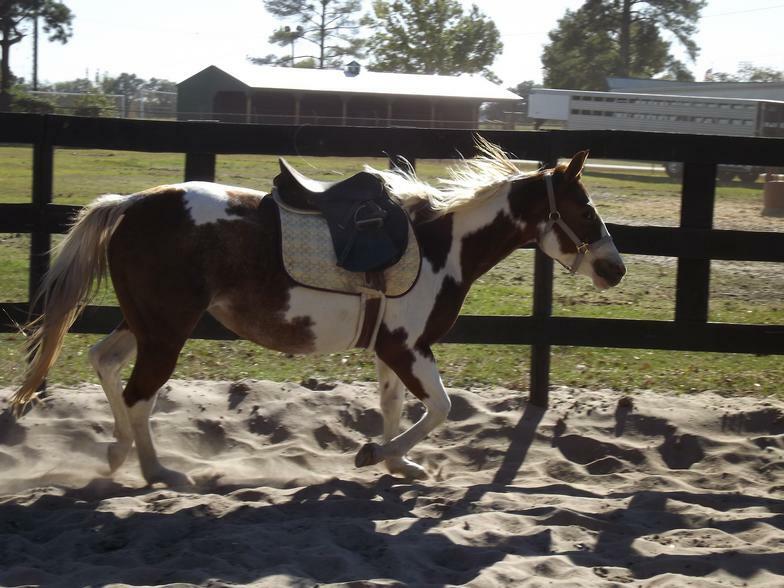 She has been on one trail ride and used in several beginner lessons with adults and children. Congratulations T & L ! We know you will love her as much as we do. Thank you for being repeat customers! The following two mares may be purchased together and bred to either of our standing registered stallions, with a live foal guarantee, for a package price of $1700.